Select the parking assist mode by pressing the Smart Parking Assist System button with the shift lever in N (Neutral) or D(Drive) and the brake pedal depressed. If the speed of the vehicle has not exceeded 5km/h with the IGN in ON, move the shift lever to N(Neutral) to select the parallel exit mode. 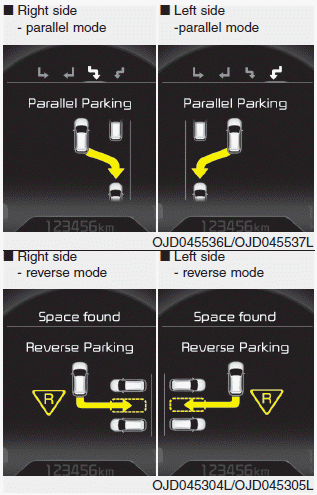 The right side parallel mode is selected automatically when the Smart Parking Assist System is activated. To select the left side parallel mode press the Smart Parking Assist System button once more.